MerchantCircle | Blog: "Follow me to Kepler's. It's our bookstore." THAT'S THE SLOGAN on the back of the new, black t-shirts at Kepler's Bookstore in Menlo Park, Calif. The beloved independent bookstore just recently reopened after a bevy of community members helped pitch in with energy, enthusiasm and investment. 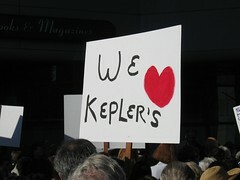 Pictures from the Save Kepler's bookstore rally. See more on Flickr. Kepler's closed suddenly earlier this year, much to the community's surprise. As a result, passionate customers and volunteers chipped in, helped build a new business plan and marketing strategy, and raised money to get the bookstore back on its feet. In a demonstration of how beloved the bookstore is, on the day of its reopening, it sold five times more books than usual. The community depends on these businesses for its relationships to flourish. The businesses depend on these local customers to stay in business. It's a symbiotic relationship that pays dividends in more ways than cash. Let me know the names of your favorite local bookstores, and we'll print them in our next blog post.